The National Institutes of Health (NIH) announced today that it is awarding $348 million nationwide to encourage investigators to explore bold ideas that have the potential to catapult fields forward and speed the translation of research into improved health. Five researchers from the University of California, San Diego have been awarded grants totaling $8.5 million for their innovative research. The full complement of awards is granted through three innovative research programs supported by the NIH Common Fund’s Roadmap for Medical Research, which include the Pioneer Awards and New Innovator Awards. The Common Fund, enacted into law by Congress through the 2006 NIH Reform Act, supports cross-cutting, trans-NIH programs with a particular emphasis on innovation and risk taking. A portion of these New Innovator Awards is also supported by funding from the American Recovery and Reinvestment Act. “Although all Common Fund programs encourage new approaches to tough research problems, the appeal of the these programs is that investigators are encouraged to define the challenges to be addressed and to think out of the box while being given substantial resources to test their ideas,” said NIH Director Francis S. Collins, MD, PhD. 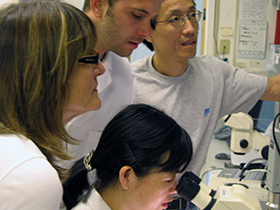 The NIH Director’s Pioneer Award Program is designed to support individual scientists of exceptional creativity who propose pioneering – and possibly transforming approaches – to major challenges in biomedical and behavioral research. The term “pioneering” is used to describe highly innovative approaches that have the potential to produce an unusually high impact on a broad area of biomedical or behavioral research. Evans is a professor of pharmacology at the UC San Diego Skaggs School of Pharmacy and Pharmaceutical Sciences. She received her PhD in biochemistry at the University of British Columbia in Canada, and conducted postdoctoral research at the Salk Institute in La Jolla before coming to UC San Diego in 1989. She will use her NIH Pioneer Award to develop new approaches to heart regeneration following injury, with a goal of finding improved approaches for treating heart failure. The focus of Evan’s research lab is to define genetic pathways underlying heart development and to apply that understanding to both congenital and adult heart disease. Heart failure consequent to ischemic heart disease – when the heart receives insufficient blood and oxygen – is the number one killer in the U.S. and developed world. After a heart attack, cardiac muscle cells are lost and replaced by fibrotic scar tissue. Her Pioneer award will further Evans’ goal of identifying pathways by which endogenous cardiovascular cells can be utilized to replace lost cardiac muscle tissue and also stimulated to help to resolve the scar, thereby improving cardiac function post-heart attack. Dr. Almutairi completed her PhD in Materials Chemistry at UC Riverside in 2005 where she received both the UC Dissertation Award and the prestigious UC Presidential Postdoctoral Fellowship. Upon completing her postdoctoral studies at UC Berkeley in Chemistry and Chemical Engineering, she came to UC San Diego in 2008 to establish the Laboratory for Bioresponsive Materials in the Skaggs School of Pharmacy and Pharmaceutical Sciences. She is also an affiliate faculty member in the UCSD Department of NanoEngineering, the Materials Science and Engineering Program and the Biomedical Sciences Program. Her research interfaces the areas of materials chemistry and engineering with biomedical sciences for practical applications. Almutairi’s New Innovator award is for a project called “Chemically Amplified Response Strategies for Medical Sciences,” in which she will investigate a new, amplified response strategy for inducing non-invasive, multi-photon-driven processes in living systems. This strategy allows previously invasive procedures to be performed non-invasively, and previously inaccessible target sites to be reached for both treatment and diagnosis. The amplified response strategy she aims to explore is inspired by one that has revolutionized the electronics industry with the advent of chemically amplified photo resistors for the fabrication of computer chips. 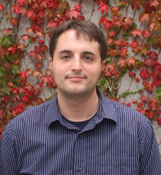 Bioengineering assistant professor Adam Engler from the UCSD Jacobs School of Engineering will use his New Innovator Award to develop new technologies for steering adult stem cells into specific differentiated cell types. The approach could yield new high-quality cell sources for cell-based regenerative therapies to treat a diverse set of muscle diseases, from muscular dystrophy to heart attacks. Engler’s project, “Smart Materials to Engineer a More Complete Stem Cell Niche,” aims to replicate stem cell niche environments, which are the highly controlled environments within organisms where stem cells develop into differentiated cells, such as cardiac and skeletal muscle cells. The new hybrid hydrogel system Engler is developing will provide adult stem cells cultured in the laboratory with conditions that mimic – in both time and space – the extracellular matrix or ECM. Found between the cells of animals, this matrix provides structure as well as crucial cell-maturation signals, such as stiffness. The hydrogel system will be tuned so that it performs roles in the laboratory similar to what muscle ECM does in the body. When combined with spatially patterned growth factors, these cues could more accurately recapitulate the development of specific tissues in laboratory cultures, and thus provide much-needed cells for a wide variety of regenerative therapies. Autism and autism-spectrum disorders (ASD) are highly heritable, complex neurodevelopmental diseases in which different gene combinations may play a role in different individuals. The study of mutations in specific genes is helping to characterize the molecular mechanism responsible for subtle alterations in the nervous system, perhaps pointing to a general mechanism for the disorder. Muotri’s project, “Modeling Autism with Human Pluripotent Cells” is a novel approach to study autism. Using one of the autism-spectrum disorders called Rett syndrome (RTT) as a pilot disease, his lab developed an in vitro system deriving induced pluripotent stem cells (iPSC) from RTT patients’ fibroblasts. RTT patients have several autistic features, and have defined mutations in a particular X-linked gene. Their reprogrammed cells can generate human neurons carrying different types of mutations. Muotri’s research will analyze gene expression during the transition steps of differentiation, simulating early stages of human neural development. In a future step, they will repeat the strategy using different mutations that also lead to the autistic diagnosis. The data generated will help to reveal and understand possible common molecular and cellular mechanisms present in autism. 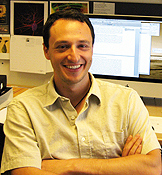 Weinberger, an assistant professor of chemistry and biochemistry, will use his award for a project called “Developing Transmissible Antivirals by Exploiting Gene-Expression Circuitry.” Its aim is to develop novel anti-viral therapies with the ability to transmit immunity from one person to another. Viral diseases like AIDS and hepatitis C are killing millions, while others, such as certain herpes viruses, cause tens of thousands of birth defects in the United States each year. Developing vaccines against them has proved exceptionally difficult so far, so the problem needs a radical new approach, according to Weinberger. His group recently developed a modified virus that can subdue HIV-1, the virus that causes AIDS, in cell culture. By taming HIV-1, they hope to reform rather than eradicate the virus; to stop it from destroying the immune system so that people can survive with the infection without developing AIDS. Related approaches, based on live virus vaccines, have been used with success against other viruses, like polio. But live virus vaccines can sometimes revert to the original harmful form – an unacceptable risk for a disease as deadly as AIDS. To guard against it, Weinberger’s group is working to develope modified viruses that will only replicate in the presence of the complete wild-type virus, meaning that the vaccine would only become active once a person becomes infected. If successful, those who are vaccinated would become “carriers” of the modified virus, thus transmitting immunity to others. Additional information on the Pioneer Award is at http://nihroadmap.nih.gov/pioneer including information on the two-day NIH Director’s Pioneer Award Symposium which begins on Thursday, September 24, 2009, and is free and open to the public. More information on the New Innovator Award is at http://nihroadmap.nih.gov/newinnovator. For descriptions of the 2009 recipients’ research plans, see http://nihroadmap.nih.gov/newinnovator/Recipients09.asp.